Comments: Evergreen broadleaf native to Queensland and New South Wales, Australia. 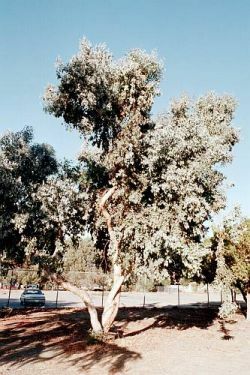 Persistant gray-brown bark on trunk and branches, Ovate to elliptic leaf, small white to cream colored flowers in clusters. Tree Tentatively identified as Eucalyptus populnea.